You’re sitting on your couch. The big match is over, and your mates have gone back to their place. But, the sports hangover is still there. How do you satisfy that urge to be involved with sports in one manner or the other? Well, how about testing out your sports trivia? Not just on one sport, but dozens, including football, cricket, basketball, tennis and more! The magic potion to satisfy that desire to be involved with sports is here, in the form of SportsQwizz, the world’s premium sports quizzing and trivia app. 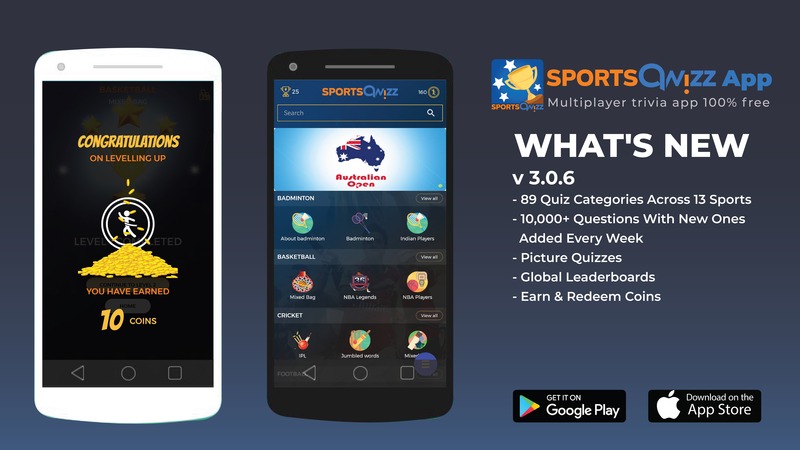 Over 10,000 questions on multiple sports and categories are housed within SportsQwizz, the go-to app for all online trivia lovers! Do you love the NBA? Then download the SportsQwizz trivia app, available on both Android and iOS, and play our curated quizzes on the National Basketball Association. Similarly, be it the Premier League, or the Bundesliga, Cricket World Cup or more, we’ve go all your sports trivia needs covered on SportsQwizz, the finest Android trivia and iOS trivia app. SportsQwizz also allows you to measure your progress by keeping track of our up-to-date leaderboard. Keep playing, answering correctly and completing quizzes and see your name rise to the top of the world’s premier sports trivia leaderboard. What’s even better? You get to earn WizzCoins for each round completed successfully! And to make things easier for you, we even provide you with the option of availing hints, or eliminating two incorrect answers from the four options available. The WizzCoins will allow you to avail exciting offers, vouchers, discounts and more at our soon to come merchandise shop or with our multiple partner websites. Thus, playing on SportsQwizz not only fulfils your passion for sports trivia games, but also translates into real world value! But if you thought that SportsQwizz was an app only for single player fun, you’re in for a pleasant surprise. Through SportsQwizz, you can challenge your friends to a duel on your favourite categories, making it the premier multiplayer trivia app on iOS and Android. Picture this. You’re with your friend, named Sumit, and are engaging in casual banter about who the highest goal-scorer in Premier League history is. You say it’s Alan Shearer, but Sumit is adamant that it’s Frank Lampard. A quick google search shows that it’s Shearer and you earn some bragging rights over your friend. Sumit, however, says that he still knows more about the Premier League than you do. The best way to prove him wrong? Challenge him to a duel on SportsQwizz and find out in real-time, who is more knowledgeable on a particular sports category. The challenge is now on, as Sumit accepts your duel request. The game has begun on the finest multiplayer trivia app in the mobile sphere. It’s you and your friend, battling it out for trivia supremacy. Question after question comes, and finally you’re declared the winner of the duel. You’re officially a Premier League Wizz with your victory over Sumit on SportsQwizz, the best multiplayer online trivia app, available both on the Google Play Store and iOS App Store! So there you have it. 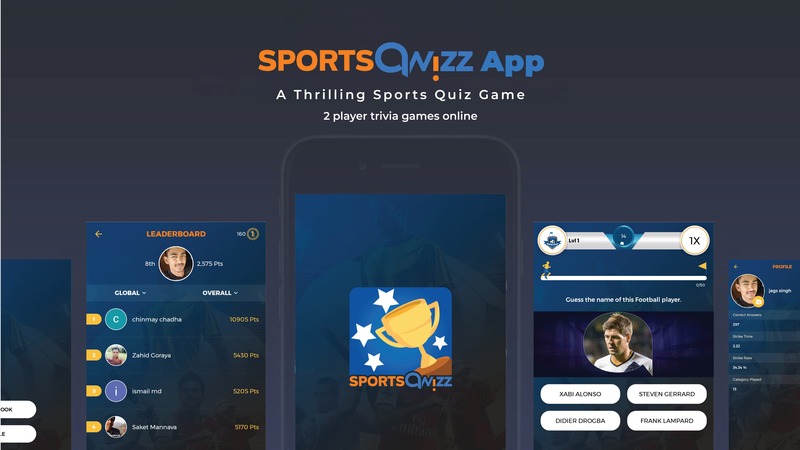 Covering a comprehensive list of sports and categories, with an ever-increasing question bank, SportsQwizz is the market leader in sports trivia apps. With it’s addictive and engaging game modes, and extensive knowledge base, you’re sure to be spending hours and hours on improving your sports trivia and showing it off to your friends. An even better moment will be when you gloat over defeating your friends in multiple categories. The best and surest way to declare yourself a sports trivia Wizz, by competing and defeating your friend in an online multiplayer trivia game. With the integration of real-time earnings through WizzCoins, SportsQwizz is revolutionizing the sector of sports trivia apps. You not only increase your knowledge base through SportsQwizz’s finely curated quizzes, but also add value to answering correctly and completing quizzes by earning more and more WizzCoins. Do remember, that WizzCoins will soon allow you to avail offers from multiple sources for all your sports cravings! So stop everything else and play SportsQwizz, the world’s premier online sports trivia app, for both single player modes and multiplayers modes. Let’s get ready to Qwizz! !